The 'Vigilant' was built for the Commissioners of Customs in 1902 for a cost of £5,390. She was powered by a triple expansion engine steamed by a single scotch boiler and attained a speed of eleven knots. Her dimensions are 100 feet, (30.48 metres) between perpendiculars, 108 feet, (32.8 metres) overall, 16 foot, (4.88 metres), beam, 8 foot, (2.44 metres), draught. She was stationed at Gravesend and used for the control and clearance of ships bound for the Port of London. She was also used by the Commissioners for Customs to inspect their posts in ports around the coast. The 'Vigilant' has an interesting history. A Customs Officer recently 'found' her being used as a houseboat in a marsh on the south coast. The Customs Service formed a trust and purchased the vessel. H.M. Customs and Excise kindly provided us with Cox and Co.'s original general arrangement drawing, the mid-ship section, their tender and specification and several photographs. The hull lines were taken directly from her when she was hauled up onto the hard. 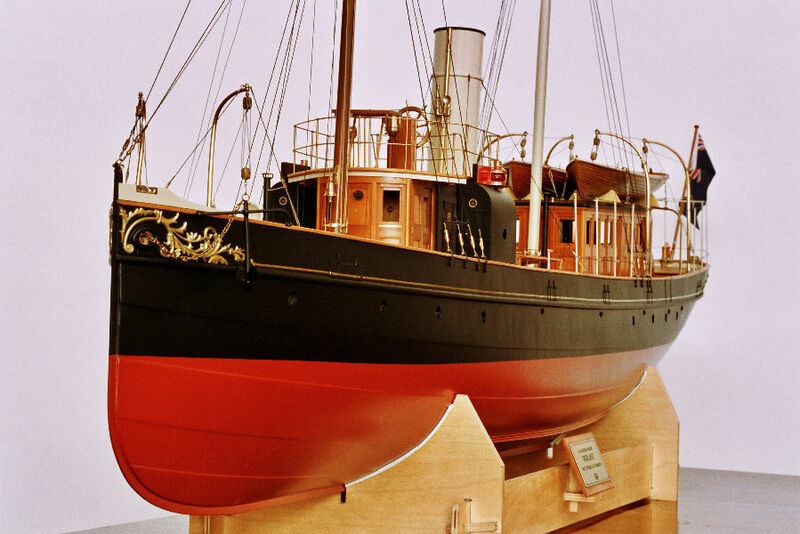 The model is to 1/24 scale and represents her as she was when launched. It should be noted that the completed model shown above is the prototype made by the kit manufacturers Marten, Howes and Baylis all other photos' are of my build. The slide show below shows the build in progress, the timbers used in the build are Pear and Lime, all the Pear components are cut from sheet veneer and the lime from strip. The brass components are either made from sheet brass or lost wax castings.